Didn't you know us top models don't get out of our beds for anything less than £10,000 a day? Ok, here's the lowdown on Kiri. Thanks for the comments and inquisitiveness so far. I got the pattern from the sidebar of Polly's blog All Tangled Up . Thank you so much Polly. I used just short of three balls of Orkney Angora St. Magnus D.K., which is a blend of 50% angora 50% lambswool and is as soft as a baby's bottom. Each ball has 200m of yarn and I purchased mine from K1 yarns which now does mail order, although I bought mine in person. I am really happy with the yarn and have cast on all two stitches for the Flowerbasket Shawl in the olive green shade. 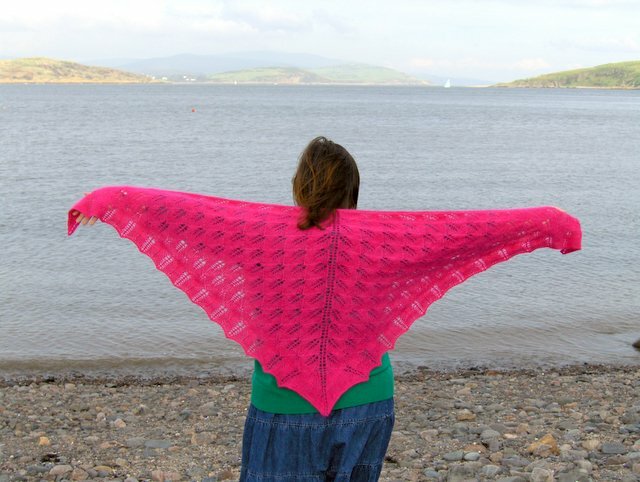 This shawl here was done in shade #20, Magenta, which is a very KEDkrafty blog template colour. I used a 5mm circ for detail hounds and my shawl ended up as 174cm wingspan (just lightly stretched), 75cm from neck to point and 393 stitches total along the diagonals. It looks fantastic. I love the colour. Your Kiri is gorgeous! And the color...oh my! I adore that brilliant pink!!! Well, this Kiri of yours is... fantastic! Perfect, absolutely, and I'm not exaggerating here! I *so* love the pattern, and the color you did it in is so cheerful and happy! Fantastic work, Kathleen! Beautiful picture with the loch/lake/sea/ocean? in the background. It is such a rich yet vibrant colour. Lovely knitting Kathleen - enjoy wearing it.